I wrote a nonfiction book in 2009 for and about a man and woman in Chiefland, Florida, who suffered first through an act of terrorism in Angola and then faced full-blow Post Traumatic Stress Disorder symptoms for nearly two decades as they faced the trials of the man’s kidnappers. 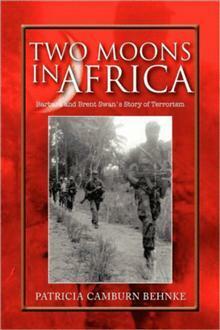 Two Moons in Africa: Barbara and Brent Swan’s Story of Terrorism by Patricia Camburn Behnke (my former name). From January 26 to February 26, I’m offering a giveaway of two autographed hardcover copies on Goodreads. The book also is for sale on my website, in both paperback and hardcover. Visit the e-store on at www.pczick.com for details on ordering. 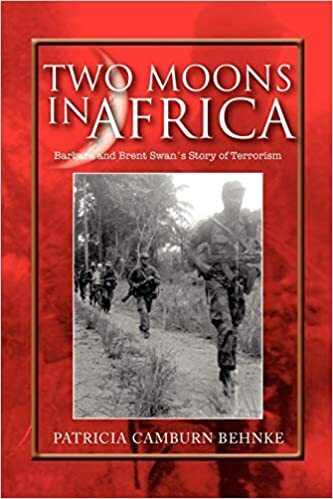 Description: Two Moons in Africa (nonfiction book 2009) – On October 19, 1990, Brent Swan, of Chiefland, Florida, was kidnapped in Angolo by members of the Front for the Liberation of the Enclave of Cabinda in Angola. When he was finally released 61 days later, Brent provided the FBI with complete descriptions of his kidnappers and their camps, but it took until 2003 for just one of those kidnappers to be brought to trial, with outstanding warrants still on file with the U.S. Justice Department for three others. The U.S. government contacts the Swans and gives them information when they might need Brent as a witness, and each time they receive a call, they are thrown back to 1990 and forced to relieve the nightmare once again. There are days when they aren’t sure who the real terrorists are. Two Moons in Africa: Barbara and Brent Swan’s Story of Terrorism brings Brent out of the jungle with Barbara at his side. It is the story of Brent’s literal journey into a dark and dank jungle at the hands of rebels. It is the story of Barbara’s journey as well as she awaited first his release and then his recovery. It is the story of the love between two people who suffered and survived. But it is also the story of a country crammed with deadly land mines and embroiled in decades-long civil wars. It tells of a people destroyed by hopeless poverty while oil fields and diamond mines sit within view but beyond reach. It shows the true meaning of Africa as the Dark Continent. It is the story of rebels so intent upon their cause that the troubles of one American family have no bearing upon their fight. In fact, these fighters for Cabinda’s liberation felt they were so right in their cause, they made Brent Swan an honorary citizen of a country that does not exist except in their minds. It is also the story of how victims of terrorism are treated in the aftermath of the terrorist act as justice is sought but not always achieved. Two Moons in Africa represents their desire to tell the story. It is Barbara’s and Brent’s attempt to take control of a situation that has been out of their hands since 1990. But it has never been out of their minds or hearts or souls.